If this chap looks familiar it’s because Fanfan the Fawn is the little brother (adopted, obviously) of Sophie the Giraffe. Fanfan joins the Vulli range of teething toys for babies, a popular choice for parents all over the world. With just the right amount of soft bumpy bits by way of ears, head, tail and legs, Fanfan the Fawn will be loved (and likely mouthed) by all. 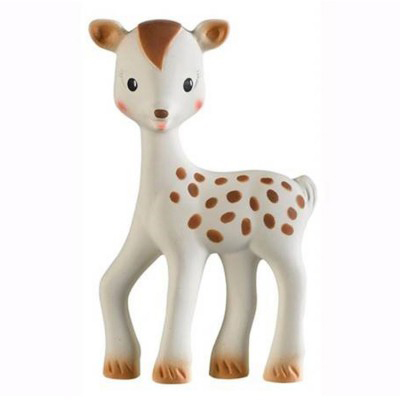 Just like Sophie the Giraffe (pictured below), Fanfan the Fawn is made from pure natural rubber so he is deliciously soft and the bonus of his beautiful food grade painted spots are pleasing to a babe’s eye. Not only does Fanfan feel glorious against the gums, he has a delightful squeaky tummy! You can buy your very own Fanfan the Fawn, priced $28 from Les Folies.